Jean-Luc Lemahieu, Director for Policy Analysis and Public Affairs at UNODC. Almost half a million people across the world lost their lives in 2012 as a result of intentional homicide, with the highest murder rates logged in the Americas and Africa, and the lowest in Europe, Asia and Oceania, the United Nations Office on Drugs and Crime (UNODC) reports. “Too many lives are being tragically cut short, too many families and communities left shattered. There is an urgent need to understand how violent crime is plaguing countries around the world, particularly affecting young men but also taking a heavy toll on women,” said Jean-Luc Lemahieu, Director for Policy Analysis and Public Affairs at UNODC, during the launch of the agency’s 2013 Global Study on Homicide today in London. Globally, men represent some 80 per cent of homicide victims and 95 per cent of perpetrators. While almost 15 per cent of all homicides stem from domestic violence (63,600), more than two thirds of domestic violence fatalities are women (43,600, almost 70 per cent). Over half of all homicide victims are under 30 years of age, with children under the age of 15 accounting for just over 8 per cent of all homicides (36,000), the study highlights. UNODC also spotlights that almost 750 million people live in countries with the highest homicide rates – mostly in the Americas and Africa – meaning that almost half of all murders occurs in countries that are home to just 11 per cent of the earth's population. At the opposite end of the spectrum, 3 billion people – mainly in Europe, Asia and Oceania – live in countries where homicide rates are relatively low. Globally, the male homicide rate is almost four times higher than for females (9.7 versus 2.7 per 100,000), especially in the Americas (29.3 per 100,000 males), where it is almost seven times higher than in Asia, Europe and Oceania (all under 4.5 per 100,000 males). While men are mostly killed by someone they may not know, almost half of all female victims are killed by those closest to them such as their intimate partners/family members, in domestic violence situations. This is particularly true in Asia, Europe and Oceania. The study also spotlights that the consumption of alcohol and/or illicit drugs increases the risk of perpetrating homicide, revealing that, in some countries, over half of homicide offenders acted under the influence of alcohol. Although the effects of illicit drugs are less well documented, cocaine and amphetamine-type stimulants have also been associated with violent behaviour and homicide. Firearms are the most widely used murder weapons, causing 4 in 10 homicides globally, whereas about a quarter of victims are killed with blades and sharp objects and just over a third die through other means (such as strangulation, poisoning etc.). Post-conflict societies awash in arms and grappling with weak rule of law and impunity are conducive to organized crime and interpersonal violence, for example in Haiti, where homicide rates doubled between 2007 (5.1 per 100,000) to 2012 (10.2 per 100,000), or in South Sudan, the homicide rate this past year was among the highest in the world. In contrast, in Sierra Leone and Liberia, where reconciliation processes and anti-crime strategies are taking root, security is gradually improving. As for conviction rates, UNODC says they are on average of 43 convictions per 100 intentional homicides. However, the study highlights strong disparities across regions, with a conviction rate of 24 per cent in the Americas, 48 per cent in Asia and 81 per cent in Europe. 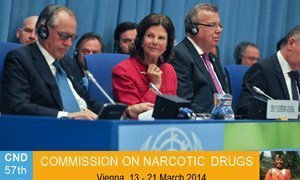 The world community must do more, and do better, to tackle the global drug problem, senior United Nations officials stressed today in Vienna, kicking off a two-day review of efforts to address a scourge that poses a serious threat to human life and undermines development.